The pre-election season used to be dubbed the silly season, but this year it might better be termed the scary season – things are getting pretty acrimonious. Following up on the scary theme, Meredith Hughes, Allison Levy, and Sam Wainwright of New Health Dialogue Blog team up to bring you Health Wonk Review: All Hallows Eve Edition. It’s an entertaining and substantive issue, and the last issue before the election. Joe Paduda of Managed Care Matters tackles the issue of physician dispensed drugs in work comp and explains how repackaged drugs can add to costs by an alarming magnitude. In 2007, California closed this loophole that allowed repackaged drugs to go “off the grid” in terms of existing pricing controls, and other states are now looking at this issue. Joe’s post compiles research and explains why this is an issue you should know and care about. Yvonne Guibert of Complex Care Blog discusses obesity and comorbidities and the impact on claims costs. She offers research and resources to help employers grapple with this issue. The current issue of Human Resource Executive also carries a good article on how obesity adds to healthcare costs, along with some approaches that employers are taking to mitigate the problem. For all practical purposes, Texas is the only state in the union that allows employers to opt out of mandatory workers comp coverage. Peter Rousmaniere takes a look at how the opt-out option has affected employers in the current issue of Risk and Insurance. And on the topic of opting out, see Good News for Texas Non-subscribers, Bad News for Excess Carrier, a post by Michael Fox of Jottings By An Employer’s Lawyer. From mancomm.com, supplier of compliance and safety training products, we received the following quiz on OSHA’s employee protection regulations, which is excerpted from their Introduction to OSHA booklet. See how well you do. 1. On OSHA’s Form 300, Log of Work-Related Injuries and Illnesses, what else might be written in the space marked ‘Employee’s name’ instead of the actual name? A.) ‘Privacy Case’ – in the event of a privacy concern case, where confidentiality is necessary. B.) The employee’s job title. C.) You must always put the employee’s first and last name, with no exceptions. D.) None of the above. 2. Which of these is an item of Personal Protective Equipment (PPE) for which an employer must pay? A.) Rubber boots with steel toes. B.) Prescription eyewear inserts/lenses for full face respirators. D.) Employers must pay for all PPE. 3. Stress is psychological, not physical, so it is not considered a common workplace health hazard. True or false? 4. Why is a confined space, such as a manhole, sewer or silo, considered a potential safety hazard? A.) It may contain too little oxygen. B.) It may contain too much oxygen, with potential for an explosion. C.) It may contain a build-up of carbon monoxide. D.) All of the above. D.) Within five working days. 6. A sedentary worker dies of a heart attack at his desk, but because it occurred in the workplace, the death must still be investigated by OSHA. True or false? A.) Has no legal recourse. B.) Can file a complaint with OSHA. C.) Has one year to file a complaint. A.) Walk off the job immediately, with full OSHA protection. B.) Use vacation time instead of doing the task. C.) Ask the employer for other work. D.) Remain on the worksite, even if ordered to leave by the employer. A.) Describe the hazard clearly. B.) Identify chemicals involved and include copies of labels or Material Safety Data Sheets, if possible. C.) Include the approximate number of employees exposed to or threatened by each hazard. A.) Physical and chemical properties of the substance. B.) The flavor of the chemical, for accurate identification. C.) Sales phone number, so more of the substance can be purchased. A.) The latest OSHA news. B.) A graphic slideshow of OSHA highlights. C.) Recent information on worker fatalities. A.) Break down into parts, subparts and sections. B.) Are presented in chapters and paragraphs, like a novel. C.) Are copiously illustrated with photographs. D.) Are written in a friendly, conversational style. Tasha Dakota Burns lived with Tony Anguiano for four years. After his divorce from his first wife became final, Tony – on several occasions – asked Tasha to marry him. Tasha did not take him seriously, because his proposals only came when he had had a bit too much to drink.Tony gave Tasha an engagement ring for Christmas in 2005. Tasha acknowledged that neither she nor Tony referred to the rings as wedding rings, but it was her intention to marry Tony. Tasha had one child by Tony, with a second on the way. Then on August 22, 2007, Tony was killed in a work-related accident, thrown from a scaffolding 40 feet in the air. The status of Tasha’s relationship to Tony suddenly became paramount. She filed for death benefits under the Kansas comp statute. At her initial hearing for benefits, Tasha testified that she believed she and Tony were married sometime in 2005 because “he gave me a ring and I gave him a ring and he wasn’t going nowhere and I wasn’t going to go nowhere.” After the two exchanged rings, she said that Tony repeatedly stated, “I’m going to marry this girl or this is my baby and I’m going to marry her.” However, Tasha admitted that Tony never stated that the two were actually married. It is painful and perhaps futile to parse the language of a couple that “ain’t going nowhere”, but parsing is what the judges in these cases must do. Under Kansas law, to establish a common-law marriage, a plaintiff must prove (1) capacity of the parties to marry; (2) a present marriage agreement between the parties; and (3) a holding out to the public as husband and wife. “Although the marriage agreement need not be in any particular form, it is essential there be a present mutual consent to the marriage between the parties” [emphasis added]. Ah, there’s the rub: a “present mutual consent.” We can probably assume that, had Tony been around to answer the question, he would have affirmed his marriage to Tasha. But Tony, alas, is gone and Tasha is left holding the proverbial (empty) bag. The Court of Appeals upheld the workers comp court in its ruling that there was no proof of marriage. In building a case to reject Tasha’s claim, the Court pointed to the fact that she continued to use her maiden name. While she claimed that it is uncontroverted that she “holds out to the public her married name, present intent to be married…and a wedding ring on her finger,” Tasha testified that she introduces herself to others as “Tasha Burns,” her driver’s license lists her as “Tasha Burns,” she signed her 2005, 2006, and 2007 tax returns as “Tasha Burns,” and she never used the name “Tasha Anguiano” in any official capacity. To which I say to the court, so what? Lot’s of women keep their original names after marriage, so a similar standard should be applied to common law marriages. Tasha took the risk of living with Tony and having his kids, without the protection of formalizing their relationship. Surely, it seemed unimportant at the time, especially as the marriage proposals came only when Tony was a bit looped. But as this tale illustrates, we never know how much time is given to us. The fates can be cruel; the days that seem to stretch far into the future can end abruptly. And the consequences of not explicitly establishing the exact nature of a relationship may haunt us for the rest of our lives. We have just one item to share today – an important and useful tool from the folks at Oregon’s Department of Consumer & Business Services: 2010 Oregon Workers’ Compensation Premium Rate Ranking, which ranks all 50 states plus the District of Columbia for rates that were in effect in January 2010. We’ve taken the liberty of excepting a graphic to give you a sampling of the information, but you really want to save a copy of the report for future reference – the data is updated every two years. The chart offers a bird’s eye comparative view of state rankings; and accompanying chart breaks data down by state. As might be expected, there is more detail for Oregon. Montana and Alaska continue to be among the two most costly states but shifted order since 2008. In 2008, Ohio ranked third highest costs, but has dropped to #17, while Illinois moves up to the #3 spot, a dubious distinction. North Dakota, Indiana, And Arkansas are the three least costly states in 2010. Massachusetts had previously been #49, rising in the ranks to #44 in a list where higher means less costly. For comparison, see the 2008 report. 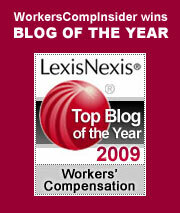 Tom Lynch offers commentary in a 2005 post: state rankings for workers compensation in a 2005 post. We are pleased to be hosting the biweekly Cavalcade of Risk. We thought we’d kick things off on a light note with these amusing ads from Bangkok Insurance that cleverly illustrate the concept of probability. As we delve into this week’s submissions, we see a few real-life examples of what can happen when people don’t pay-to-play in hedging against risks. Khaleef Crumbley at KNS Financial talks about whether pay-to-spray fees are good idea or not in his post about the recent TN case where firefighters stood by as a home – and the pets within – burned to the ground because the owner forgot to pay his annual $75 protection fee. This case was notable because it involved a public service, but Tred R. Eyerly of Insurance Law Hawaii posts another cautionary tale about paying fees on time – this one involving an insurance company. He discusses a legal case in which the court denied an insured’s claims against its flood insurer. If you aren’t happy with your insurance coverage, Jeff Rose of goodfinancialcents offers 6 factors that make switching insurance companies and firing your agent all worth it. But if you are considering a switch in insurers, Nancy Germond of AllBusiness.com suggests that you not be too hasty and you don’t do it for the wrong reasons because cut-rate insurance may cost you much more. And when considering insurance coverage, Silicon Valley Blogger reminds us about coverage to which we are often entitled but frequently overlook: Extra insurance coverage through credit cards: use those perks. Henry Stern of InsureBlog notes that if you think those big old Bel Airs of your parents’ day were safer than today’s econoboxes, think again. He offers compelling video evidence in his post Retro Risk Reduction. And while on the topic of transportation risks, we point to our own post on a rather unsettling mater: the sorry state of medical certification of commercial drivers and other public transportation regulatory issues. Ironman at Political Calculations cautions that you not let technological advances leave you in the dust. He offers a cool tool to help you assess whether you are keeping up: When will you become obsolete?. But while technology advances offer opportunities, they are not without their own risks. Emily Holbrook of Risk Management Monitor posts that if we find ourselves in a courtroom, social media has increased our risk for an unfair trial. Sometimes our risk comes from quarters where we least expect it. We’ve all been alerted to the dangers of identity theft – but usually we expect the danger to be from strangers. Wenchypoo of Wisdom from Wenchypoo says that the danger is sometimes all in the family. She posts on the strange phenomena of parents stealing their kids’ identities. David Williams of Health Business Blog tells us that reducing the use of head CT scans for certain kids can reduce cancer risk, improve customer service and maintain quality. The only new risk is to reimbursement: Fewer scans often mean less revenue for the provider organization. Speaking of kids, Louise of Colorado Health Insurance Insider suggests a real-world compromise for child-only policies, which would offset the increased risk that insurers take on in guaranteed-issue, open enrollment periods for child-only policies. If you haven’t heard about accountable care organizations(ACOs) yet, click on over to Healthcare Economist. Jason Shafrin talks about why providers love ACOs. Hint: it may be less about improving patient outcomes and more about market power. Jaan Sidorov of Disease Management Care Blog offers 10 reasons why health insurers that offer fully insured products are unlikely to offer work-site wellness programs anytime soon – despite their cost saving potential. When a laborer is unable to perform physical work, the options are limited, not only for the worker, but for the workers comp system as well. Meet Pennsylvania’s Sam Muzzicato. He came to America from his native Italy in 1969. He had only four years of schooling in Italy. He immediately went to work in America and continued working until January 2007, when he injured his back while employed as a laborer for Strow’s Plumbing and Heating Company. Do you see a common denominator in all of these jobs? Some degree of computer literacy is needed. The Administrative Law Judge dismissed the first four jobs as not within Sam’s capabilities, but for unknown reasons determined that he could perform the desk clerk position. With this theoretical job available, the ALJ approved a reduction in Sam’s weekly indemnity benefit. Sam appealed to the Commonwealth Court, where the judges determined that the inclusion of the single job by the ALJ was capricious, and that Sam was incapable of performing any of the jobs recommended by the voc expert. Sam, in other words, has few, if any, transferable skills. When his body broke down, he had nothing to bring to the marketplace. As a result, his full indemnity will continue. Sam’s story is by no means unique. Many of the immigrants who came to this country to find work had limited education in their native lands. Once here, they were too busy or too indifferent to pursue educational goals. They gained a foothold through hard work, perhaps shifting educational goals onto their children. Now as they enter the waning years of employment, their bodies break down. Where once they recovered quickly from workplace injuries, now the pain lingers, eroding their capacity to work. And once out of work, there is literally no place to go. What lies ahead for the Sam Muzzicatos of the world? While it sounds odd to say it, Sam is lucky that he was injured at work. His back problems will be treated through the comp system for the foreseeable future. He will collect roughly 2/3 of his average weekly wage, tax free, at least until his eligibility for temporary total benefits runs out. After that, he will probably qualify for some form of permanent partial award. Sam, in other words, will transition rather smoothly into retirement through the generosity of the workers comp system. Strow’s Plumbing and Heating will foot the bill through the experience rating process for three years. After that, the insurer will be on the hook for whatever is owed to Sam. Is this fair? Does it make sense? Is Sam being rewarded for his failure over the years to improve his skills through education? Ironically, if Sam did have transferable skills, his benefits would have been reduced, despite the fact that he might not be able to find work in this troubled economy. Would that have been fair? Indeed, in the world of workers comp, as judges parse the letter of the law and and employers struggle to pay the bills and injured workers battle to survive, is fairness even an issue under consideration? Click on over to Healthcare Economist, where Jason Shafrin has posted Health Wonk Review to the “Rescue”, a most excellent edition of health policy wonkery, proving that our regular participants have as many trenchant opinions and observations about healthcare post-reform as they did pre-reform. Elation – There aren’t all that many good news stories when you hear about a mine collapse but the world has just witnessed one of the rare exceptions in real time. Reuters put global TV viewership at more than a billion – everyone united to see a different kind of reality TV. The Boston Globe offers a powerful portfolio of rescue photos from the Big Picture, and you can also see an in-depth portfolio from the Chilean Government’s Flickr photostream. Newsweek offered a simple but powerful infographic about the ordeal: What if everything you needed to survive had to fit through this space? and The Telegraph offers excellent diagrams of the mine shaft and the rescue. If you haven’t had a chance to read Wright Thompson’s excellent article in Sports Illustrated, Above and Beyond, make it a point to do so. It’s a well-written article that explores the human story from the perspective of one of the miners, a former soccer star, and it also gives a glimpse into the miners’ ordeal and the engineering challenge of the rescue. Also noteworthy: Ken Ward’s thoughts posted at Coal Tattoo. Ward reports on West Virginia mining matters for the Charleston Gazette and has covered far too many mining stories that did not have happy endings. He writes about what we can learn from the Chilean mine rescue. More on medical marijuana – “Would a request to pay for marijuana be subject to utilization review? What standards would utilization review use to review it?” These and other issues are considered in a recent article on medical marijuana in Risk & Insurance. In all, 14 states and 27 cities have legalized medial marijuana, which means that employers need to familiarize themselves with the laws governing their work force. Substance abuse expert William J. Judge says that employers should treat medical marijuana just as they would any other drug, such as opiates and amphetamines. He notes that the latter are a class of drugs that are illegal until prescribed. Lifestyle issues and comp – My colleague Jon has been posting about obesity issues as they play out in real-world scenarios. 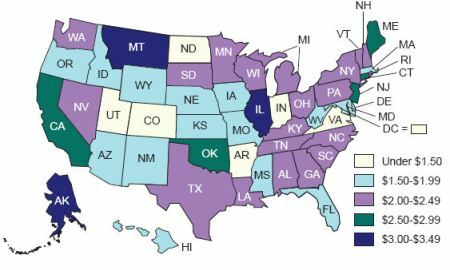 Meanwhile, a new obesity report by the CDC explains the reason for concern, In 2000, there were no states with an obesity prevalence of 30% or more; now there are 9 states. Also, there is no state with an obesity prevalence of less than 15%. In addition to increased legal challenges around obesity issues, there is the additional factor that obesity hinders recovery. And it is not the only so-called “lifestyle issue” that puts a drag on recovery. The folks at Work Comp Complex Care blog look at smoking and how it impacts complex care recovery. Social media – managing the risk – Check out More Media, More Opportunity, More Risk: The Upside and Downside of Social Media in this month’s issue of Risk Management Magazine. It’s a series of six articles that cover the benefits and the risks involved in social media, allowing with tips for how to manage the risk. Free online WC conference – Over at Comp Time, Roberto Ceniceros notes that he will be moderating a free online workers comp conference which will address safety, cost control strategies, alternative risk financing, and comp claim medical costs, among other topics. It’s schedule for December 9, and will run for 5.5 hours. Obesity as a health problem is not going away, nor is the issue of whether obese people are considered disabled under the Americans with Disabilities Act (ADA). The latest iteration of this saga involves the late Lisa Harrison, a morbidly obese employee of Resources for Human Development (RHD) in New Orleans. Harrison, an intervention prevention/specialist, worked with the children of mothers undergoing treatment for addiction. By all accounts, she performed her job well, but RHD viewed her as limited in a number of major life activities, including walking, so they fired her. Harrison died before the EEOC filed suit, but the lawsuit lives on. It’s important to note that the EEOC is not basing the lawsuit on obesity itself, but rather on the idea that RHD perceived Harrison to be disabled. That’s why they fired her. The larger issue – so to speak – is whether morbid obesity in itself is a disability. This particular case will not attempt to resolve that condundrum. Thus far, the courts have resisted the idea that any and all obesity is a disability. They look for physiological causes for the obesity, including thyroid disorders and genetics. If there is no specific medical cause for the weight problem, obese people are generally not considered to be disabled. It all comes down – as it usually does – to the ability to perform the essential functions of the job. Harrison did not seek any accommodation based upon a disability. She simply did her job and apparently did it well. It will be interesting to see whether the RHD defense raises the issue of risk: whether Harrison’s morbid obesity placed her or her young charges at immediate risk of harm – not hypothetical, but imminent – a difficult standard to prove. The story of Adam Childers, the obese pizza maker whose stomach stapling operation was covered by workers comp. The federal case involving Stephen Grindle, whose job loss due to obesity was not covered by the ADA. There is no doubt that Ronald Babin, an electrician in Louisiana, was injured at work. He was in the bucket of a truck, working on a transformer, when the bucket mechanism malfunctioned, crushing the bucket into the transformer for several minutes. Babin huddled in the bottom of the bucket until co-workers were able to gain control of the mechanism. He hurt his back. This sounds like a straight-forward workers comp case, but Babin ran into a complication. This was not the first time he had hurt his back.He had four prior back injuries involving two herniated discs. At one point he was out of work for nearly two years with back problems. When he applied for the job with Ernest Breux Electric, he filled out several pre-employment questionnaires. One asked if he had any “current or prior back injuries” (this question could well be illegal, but that’s an issue for another day). He answered “no.” On another form, he admitted to having a “back strain” – but again, did not mention serious disc problems. Thus, Babin misrepresented his medical history. His employer relied upon that misrepresentation in hiring him. And his subsequent injury was directly related to the condition he failed to disclose. Bottom line for Babin: his claim was denied. By hiding the truth, Babin essentially was working without a safety net. This might not have mattered if the injury had not aggravated the pre-existing condition. But as soon as his aching back became involved, Babin lost access to the protections of the comp system. Speaking of second injury funds, our colleague Peter Rousmaniere has recommended that they all be abolished. He makes a compelling case. The money in second injury funds is derived from fees paid by all insureds. However, the primary beneficiaries of these funds has not been the employers, who took the risk in hiring disabled workers, but the insurance companies, who generally pocket the payments from the funds. They are not obligated to recalculate experience modifications and return premium dollars to the insureds. Some are diligent about doing this, others are not. Second Injury funds may not be the most effective means of encouraging employers to hire partially disabled workers. And it’s clear from this particular story that these workers should not try to lie their way into a job. In the best of all possible worlds, disabled workers would not be penalized for their candor in disclosing disabilities and employers would not be penalized for the additional risk of hiring them. But in case you have not noticed, this is hardly the best of all possible worlds. Special thanks to Work Comp Central (subscription required) for their heads up on this and many other interesting cases. On Mother’s Day in 1999, Custom Bus Charters’ bus driver Frank Bedell veered off a highway near New Orleans, killing 22 passengers and injuring 20 others. Just 10 hours before this trip, Bedell was treated at a local hospital for “nausea and weakness.” He had been treated at least 20 times in the 21 months prior to the accident, and 10 of those times involved hospitalization for “life-threatening” heart and kidney disease. You can read more about this horrific crash, which remains one of the nation’s deadliest bus crashes, at NOLA.com: Loopholes let sick man drive, safety board says. Also of interest: Breaking the law went with the job. This accident brought the issue of the medical competence of commercial drivers to the public attention in a dramatic way. In its subsequent report of the accident after the investigation, The National Transportation Safety Board (NTSB) determined that “…the probable cause of this accident was the driver’s incapacitation due to his severe medical conditions and the failure of the medical certification process to detect and remove the driver from service. Other factors that may have had a role in the accident were the driver’s fatigue and the driver’s use of marijuana and a sedating antihistamine. The incident and investigation prompted NTSB to issue Safety Recommendations revolving around medical certification of commercial drivers. The article paints a scary portrait of a driver medical certification program that is pretty broken. Truck drivers can pop into roadside clinics to pick up certifications issued after a cursory examination by almost any health professional. And that’s a good scenario – drivers can also download online certificates and fill them out themselves or ignore the requirement entirely. Forgeries are a common occurrence. Being caught without a certificate might result in a slap-on-the-wrist fine. While there have been calls for a national registry for medical certification of commercial drivers, the idea has made little progress. It will probably take the next big incident to ignite public outrage to motivate any change. For a resource on current regulations, see the US Department of Transportation Motor Carrier Safety Administration’s Medical Programs, which includes medical regulations and notices, including drug and alcohol testing. “NTSB does not track fatigue-related highway accidents on a regular basis. But in 1993, the board commissioned a study expecting to learn about the effects of drugs and alcohol on trucking accidents. Investigators studied all heavy-trucking accidents that year and made an unexpected discovery: Fatigue turned out to be the bigger problem. NTSB Crash investigators said driver fatigue played a key role in a bus accident in Utah in 2008 that killed nine people returning from a ski trip. “More maintenance has moved overseas. Airlines are not required to use regulated repair shops. Foreign repair stations can go five years between inspections, and even then are often tipped off that inspectors are coming. Manuals are in English, but not all the workers read English. Drug tests of workers are illegal in some countries. The NTSB keeps a most wanted list of transportation safety improvements, in which it makes recommendations for critical safety improvements for various transportation sectors. Recommendations are designed to improve public safety and save lives, but many have been on the list for years. In some cases, individual states may have requirements, but these recommendations are national in scope. While issues on the “most wanted list” are pending, individual employers might use the list as best practice guidance for safety programs to limit exposure both for workers compensation and other liability issues that might arise from commercial transportation accidents. You can find more reports on transportation and public safety at News21, “a national initiative led by 12 of America’s leading research universities with the support of two major foundations” with a purpose of furthering in-depth and investigative reporting. In 2010, one of the main areas of focus has been Breakdown: Traveling Dangerously in America.